It's April 2017 and Enda Kenny is still Taoiseach. The only fools this April are those of us who thought he'd be gone by now. The Irish political battlefield is littered with the bodies of those who underestimated Enda Kenny. Predicting when he will finally go is a tough business. It looks like Kenny will step down from the leadership before the summer to allow an orderly handover. But we were sure that he would go by the end of last summer, then after the Budget, then Christmas, then after St Patrick's Day. And here we are. He's had his diminishing band of loyal ministers out to play the line that we need Enda for the dual crises of Brexit and Northern Ireland. Only Statesman Enda knows the European Council, they say. Only he has the experience in the North to deal with this. Politics looks forward. The European Council will get to know and learn to deal with a new Taoiseach very quickly, and the civil servants will brief that Taoiseach well. He's never really shown much interest in Northern Ireland, except to float the suggestion that Brexit could unify Ireland. And Enda is hardly an electoral asset. He lost an election that he could have won, and hasn't covered himself in glory in this Dail. Yet another Garda blunder isn't his fault, but neither he nor the minister he put in to sort out the mess, Frances Fitzgerald, appear to be on top of it. He's giving no political direction to Shane Ross on the bus strike. The Government is drifting along, which is making it harder to anticipate and prepare for the challenges of Brexit. Those who are protecting Enda are likely to be the ones who reckon their chances of surviving a change in leadership are slim, and so are seeking to extend their ministerial lives. But why are the challengers so relaxed? 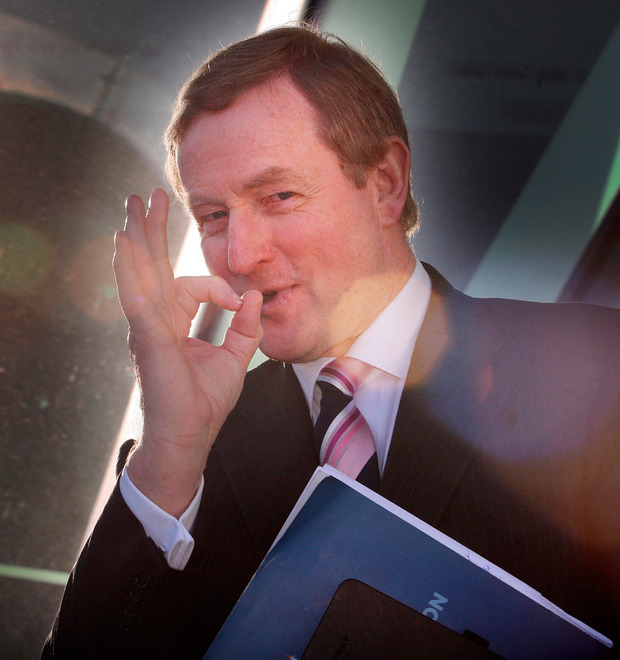 No one, apart from Noel Rock, is willing to say that Enda the Emperor has no clothes. Leo Varadkar doesn't want to be seen to push Kenny because he fears a backlash from Enda loyalists. Simon Coveney appears content to wait, in the expectation that time will see Varadkar's lead diminish. Varadkar could get around this problem by promising to leave Kenny as Taoiseach until a new election, while he could strike a more distinctive, bolder position for Fine Gael. It doesn't say much for Fine Gael that it has two leadership contenders so unwilling to take personal risks. Leaving Enda in situ risks a snap election with no new leader - a hard exit. The factor helping Kenny is that most people who can cause an election don't want one. Backbenchers never like elections, but Fianna Fail is in the comfortable position of not wanting an immediate election but not being scared of one either. But what happens when Enda finally resigns the leadership, will there be an election? It depends on who wins the leadership, and whether there is an extended period with Kenny as Taoiseach while the new leader settles in - a soft exit. Either Coveney or Varadkar will naturally want to become Taoiseach. It is a position that bestows some authority, and a little experience on the European stage can only enhance their reputations. That is a factor that Micheal Martin will be conscious of. Martin had a good election last year. It put to bed all the leadership questions some in Fianna Fail were asking in 2014 and 2015. But his appearance as a fresh face was mainly down to the fact that he was up against an unpopular Kenny, a jaded Joan Burton, and a polarising Gerry Adams. Labour and Sinn Fein may not have solved their leadership problems, but if Fine Gael solves its one, Micheal Martin's attractions may be less easy to spot. Against a more youthful leader such as Varadkar or Coveney, Martin could look like the jaded one. Martin may also be influenced by his constituency position. It would hurt to see his city rival, Simon Coveney, elected as Taoiseach. For Varadkar, conversely, there is some thinking that a spell in government will only tarnish his reputation, especially if it is a government that is so hamstrung. If Martin can get over electing Coveney as Taoiseach, it's possible to see the Government last until 2018. Coveney is a natural compromiser, or more positively a deal-maker. Fianna Fail is comfortable with the direction of the polls and its new TDs can only benefit from an extended period in opposition. The party can behave responsibly, enhancing its reputation as a party of government. Coveney will make it harder for Fianna Fail to bring down the Government, but you just need to look at the past six months to see there are always reasons available to cause an election should Fianna Fail want one. Varadkar is not a natural compromiser, and so might be unwilling to be pushed around the way the Kenny government has been in the past year. It is easy to see him carve out a distinct position for Fine Gael on the right, to stick to that position, and hence for the two parties to fail to agree a Budget in the autumn. This could suit both Fianna Fail and Fine Gael, as it would give a focus to the electoral campaign, and might side-line the smaller parties and Independents. Under Varadkar, the Independents might also decide to strike out. The date of the next election is uncertain, but the nature and timing of the Fine Gael leadership change will loom large. In the meantime, we drift on.